Few people can claim to have pioneered in punk and glam rock as well as put their own spin on soul, blues, funk, folk, and psychedelia. Probably one of the most complex characters in music, Bowie was constantly reinventing himself to keep from being defined. Lyrically, his songs are provocative, making the listener question themselves, society, and even life itself. What other person would write a song starting with “I’m an alligator, I’m a mama-poppa coming for you,” and yet leaves you questioning everything you thought you knew about society, humanity, and life itself? By dabbling in so many genres, Bowie has become an influence to artists in a myriad of genres. David Bowie truly is an anomaly. 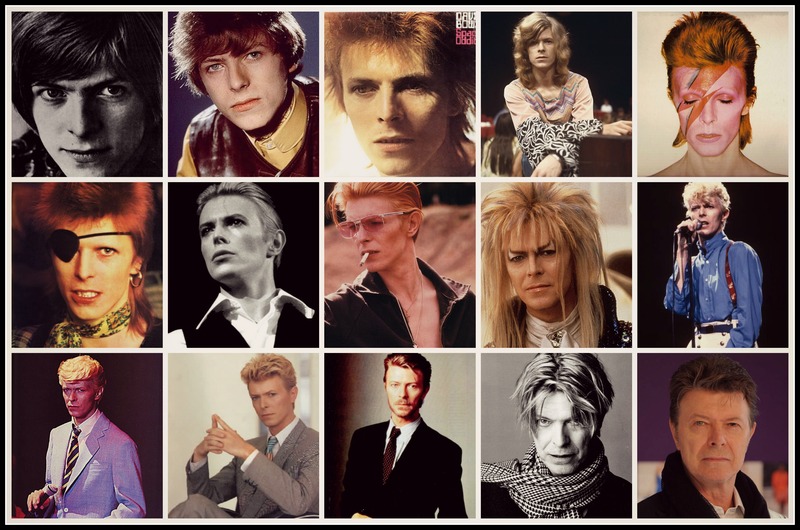 The many faces of David Bowie. While there will never again be another David Bowie, there is a lesson that others could learn from him. We live in an era where everyone is expected to follow a specific code – to conform to the status quo for fear of judgement. Why is it that when you meet someone for the first time, one of the most common questions is, “What do you do for a living?” or “Where do you plan on going to school?”. People judge others based on what they do, therefore we fear straying from what is considered “respectable” or “appropriate”. David Bowie dared to challenge what was considered the norm many times over, and yet he was successful. It’s possible to do what others may think is bizarre or absurd and still be successful in life. If David Bowie can achieve success by painting lightning bolts on his face, dying his mullet bright red, wearing ludicrous costumes, and making great music, then why can’t anyone make a living by following their dreams, even if it is a bit unconventional? 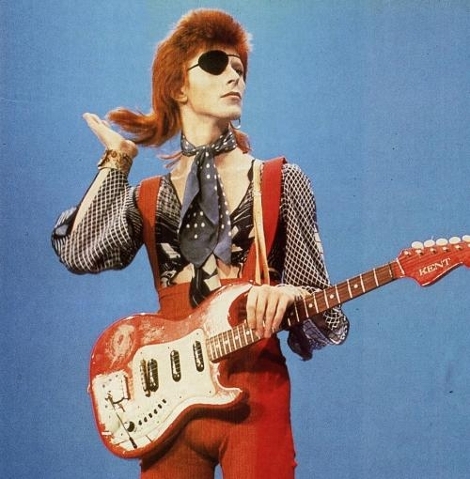 Even if you’re dressed like this (no offense Mr. Bowie, both your outfit and hair flip are fabulous) you can be successful. As long as you are yourself. One of Bowie’s earlier songs, released in 1969 nine days before Apollo 11 landed on the moon. The man has good timing. From the legendary album “The Rise and Fall of Ziggy Stardust and the Spiders from Mars” (and I suppose Gaurdians of the Galaxy too, but it was cool before then) the heavily distorted chords in the intro to Moonage Daydream are iconic rock and roll. Add some wacky lyrics about alligators, space invaders, and electric eyes and you’ve got ultimate Bowie. Here’s a few other great examples of Bowie experimenting with different genres of music. Out of every he’s done, there’s just about something for everyone. Inspired by a day-long jam session with John Lennon. Don’t let me hear you say life’s taking you nowhere. A classic tale of East meets West. Featuring Stevie Ray Vaughn (one of my all time favorite guitarists). And of course, his famous duet with Freddie Mercury (no, it’s not Ice Ice Baby). Happy Birthday David Bowie, and may you keep on being amazing. It doesn’t matter how different we are. We’re all weird, what separates the amazing people from the ordinary ones is that the amazing ones use their weirdness to their advantage. Well, he’s also the Man Who Sold the World, the Thin White Duke, Aladdin Sane, Pierrot,and Jareth the Goblin King. Maybe he’s got Disassociative Identity Disorder? Maybe… That could support my theory that “Bowie Base 1” in “the Waters of Mars” is a reference to David Bowie and is maybe even named after him. With songs like Space Oddity, Moonage Daydream, Ziggy Stardust, and, of course, Life on Mars, he must be a time lord!